After leaving Southampton Titanic proceeded to Cherbourg where she arrived just after 6pm on the 10th April and dropped anchor at 6.30pm. The 274 passengers eventually boarded tenders, having had to wait around for an hour following the delay from the New York incident in Southampton. 24 of Titanic’s passengers disembarked at Cherbourg, their trip complete. At 8pm Titanic resumed her voyage, and headed for Queenstown (now Cobh) which she reached the following morning at 11.30am. Stopped about two miles from shore, 120 passengers (seven were second class, the rest third) boarded tenders America and Ireland along with 1,385 sacks of mail to be tranferred to the great ship. 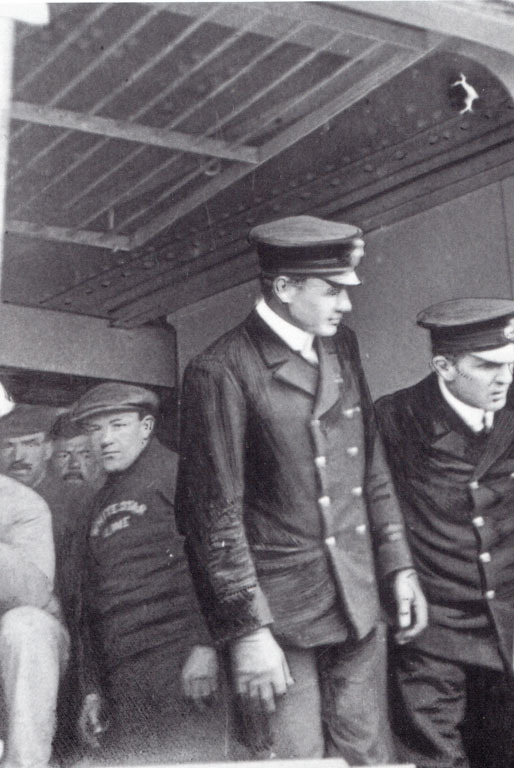 Left Fourth Officer Boxhall, Second Officer Lightoller and crew about to close the gangway to leave Queenstown. Seven passengers left the ship, and stoker John Coffey from Queenstown deserted, having taken advantage of a free ride home. At 1.30 pm Titanic raised her anchor and left land for the last time carrying 1,316 passengers and 891 crew. The first days of the voyage passed as a relaxing routine established. Mealtimes were a focal point, announced by the ship’s bugler P. Fletcher, with each class experiencing a higher standard of luxury than on most other ships of the day. 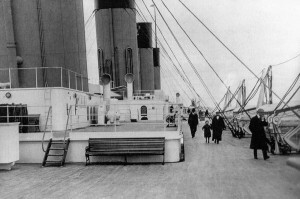 While First Class passengers could visit the swimming pool (the second ever to be installed on a ship – Olympic’s was the first), Turkish Bath or gymnasium, Second class passengers had their own library and reading room, smoke room and promenade, and Third Class had a promenade, smoke room and lounge complete with piano in addition to the dining rooms. By Sunday evening 14th April a drop in temperature outside was distinctly noticeable as the crew kept a special lookout for ice, following wireless warnings from other ships.